WHAT is happening in Karnataka today is a typical example of political opportunism. The Janata Dal (Secular) and the Bharatiya Janata Party have revived their ties to capture power. In their scramble for power, they have thrown all norms, principles and ethics to the wind. The massacre of newly married Anup, son of former Jharkhand Chief Minister Babulal Marandi, and 16 others by Maoists in a pre-dawn attack at Chilkhadih village of Giridih district on Saturday is yet another proof that no life or place is secure in Jharkhand and Bihar. AMITOZ KAUR, the doctor-bride in Patiala who rejected NRI doctor-groom Gurpreet Singh, who demanded a dowry of Rs 50 lakh hours before they were to take the vow as man and wife, deserves encomiums for her boldness and principled stand. The share market has been giving the investors the jitters. Few know which way it would go next. Recently, after touching a peak of 19,198.66, the Bombay Stock Exchange index came down to 17,559.98, and more such fluctuations are in store. The first time I came across the slogan “Chak De” was when I was driving beyond the Rohtang pass into the Lahaul-Spiti valley a few years ago. It was profused written all along the perilous passage as the war cry of a border road organisation. Though the Tamil Tigers have been steadily losing ground to the Sri Lankan armed forces this year, the ‘Tiger Air Force’, the air arm of LTTE, has been gaining strength. On October 22, the LTTE launched a pre-dawn coordinated ground and air strike on the Anuradhapura air base that killed 14 soldiers. Three military helicopters were destroyed on the ground. Last week, US President Bush announced new sanctions against Myanmar’s military government. But world oil prices – which hit record levels last week – may undercut their effect. Myanmar has recently gained admission to an elite club of states whose governments use their oil and natural gas to buy their way out of trouble. Call them the petro bullies. Delhiites have welcomed the High Court’s order telling VIPs who feel unsafe and want cops around them to stay at home, and give the locals a breather. Such VIPs had actually become a hindrance to the common man in the market or on the road. Such security cover was used more for getting importance and showing off, along with parking at odd places and cutting across queues. WHAT is happening in Karnataka today is a typical example of political opportunism. The Janata Dal (Secular) and the Bharatiya Janata Party have revived their ties to capture power. In their scramble for power, they have thrown all norms, principles and ethics to the wind. On October 9, the state was put under President’s rule and the Assembly kept under suspended animation following the BJP’s withdrawal of support to the JD(S)-led coalition after the latter refused to transfer power to the former as per the 20:20 agreement. The root cause of the trouble was Mr H.D. Deve Gowda’s rigid stand on his son Mr H.D. Kumaraswamy’s continuance as chief minister. As the BJP promptly made what it calls a “betrayal” a big issue, the JD (S) ranks became jittery and were scared of facing an early election. Mr Deve Gowda desperately tried to make peace with the Congress but failed. The Congress wants the dissolution of the House and early elections. It has not forgotten the humiliation it suffered when the JD(S) ousted the Dharam Singh government and aligned with the BJP. Politics, indeed, makes strange bedfellows. For Mr Deve Gowda, the BJP became “communal” after it ditched the Kumaraswamy government. This was his stand until Friday last. However, the very next day, the party became trustworthy. As a vertical split in the JD (S) is a possibility, he wants to mend his fences with the BJP. Senior JD (S) leader M.P. Prakash has questioned the rationale for Mr Deve Gowda’s unilateral decision to join hands with the BJP to form a government after deputing him to New Delhi to hold parleys with the Congress on government formation. Mr Prakash has termed Mr Kumaraswamy’s letter of support in Mr Yediyurappa’s favour to the Governor on Saturday as “invalid”. Meanwhile, fearing poaching, Mr Kumaraswamy has shifted his 40-odd members to a resort in Bangalore’s outskirts. The BJP will be happy if Mr Yediyurappa becomes the new chief minister. Of course, Mr Deve Gowda will extract his pound of flesh and create hurdles in the smooth functioning of the government. Sadly, governance has become the worst casualty in this techno-savy state. Unfortunately, there is no accountability on the part of the elected representatives and the people have become the sufferers. It is a pity that these parties will do anything for power. The massacre of newly married Anup, son of former Jharkhand Chief Minister Babulal Marandi, and 16 others by Maoists in a pre-dawn attack at Chilkhadih village of Giridih district on Saturday is yet another proof that no life or place is secure in Jharkhand and Bihar. In March, they got former Jharkhand Mukti Morcha MP Sunil Mahto equally easily during a football match. They did exactly the same during a cultural programme organised as part of a local five-day football match. Even if this was only in retaliation against the recent police action against the terrorists, it does not present the state police administration in a good light. As the Additional Superintendent of Police of the district has admitted, the in-charge of the Deori police station, under which Chilkhadih falls, was deputed along with police personnel for the football match and the cultural programme, but he returned in the evening itself after prize distribution without waiting till the end. Such lapses are routine despite the serious threat posed by the Maoists. A distraught Mr Marandi is not wrong when he says that the Naxals have spread their tentacles in all districts of Jharkhand and 165 districts in the country. Yet, there is no holistic policy in place to tackle them. The police force is in most cases understaffed and under-equipped, whereas the rebels boast of sophisticated weapons. From where they get these should be no secret to the governments at the Centre and in the states, but the routes have yet to be plugged. Jharkhand Chief Minister Madhu Koda has called the killings a “conspiracy”. Every such planned massacre is actually a conspiracy. Perhaps what he wants to convey is that there is a political angle to it. Instead of levelling charges, he should concentrate on improving the law and order situation. For once, the governments of Bihar and Jharkhand have joined hands to conduct a massive combing operation in the contiguous areas of the two states to track the attackers. This kind of common effort should have been made before the killings. The right message will go to the terrorists only if the killers are punished duly and quickly and other preventive steps taken. AMITOZ KAUR, the doctor-bride in Patiala who rejected NRI doctor-groom Gurpreet Singh, who demanded a dowry of Rs 50 lakh hours before they were to take the vow as man and wife, deserves encomiums for her boldness and principled stand. Raising such a huge sum would have been beyond the means of her father, an employee of a nationalised bank. Even if he was able to meet the demand, there was no certainty that he and his family would not ask for more after the marriage. There have been countless cases in which NRI grooms have come to India in search of brides, pocketed huge dowries and took their wives to the countries where they lived only to torture them on one pretext or another. The bride and her family did the right thing by complaining to the police under the anti-dowry Act. The doctor-groom and his parents have found their rightful place in police custody. The practice of demanding and receiving dowry has not ended although dowry has been declared illegal. This is because dowry has, unfortunately, some social sanction. What is disconcerting is that even those who have been exposed to the dowry-less traditions in the West like the NRIs want dowry in marriages. The groom in the instant case lived in the US where dowry is not a component of marriage. Had he made such a demand in the US, he would have been arrested and tried for extortion and a host of other charges. Modernity is a state of mind and it cannot be acquired by living in a modern society as Gurpreet Singh shows. The craze for “phoren” is another depreciable aspect of marriages in Punjab. Parents of girls want them to marry NRIs as they see it as a passport to good life. What’s worse, even rich parents are ready to sell their landed property to meet the demands of greedy grooms. In this particular case, too, appropriate inquiries were not made about the boy and the kind of family he had before the marriage was finalised. It is laxity on the part of the girls’ families that eventually leads to situations where NRI wives suffer. Also, few fear the law when it comes to demanding and accepting dowry. One way out is that girls like Amitoz Kaur should stand up and simply say ‘No’ to demanding bridegrooms and in-laws. The share market has been giving the investors the jitters. Few know which way it would go next. Recently, after touching a peak of 19,198.66, the Bombay Stock Exchange index came down to 17,559.98, and more such fluctuations are in store. This was not unexpected, given the rapid rise in the index in the preceding two months and especially in the preceding two weeks. Investors were getting used to hearing that the index had climbed by 1,000 points in six or four trading sessions. It was a bullish market which seemed to have no stops. The media, specially the pink papers, with screaming headlines were egging the investors on with stories of investor wealth going up by lakhs of crores of rupees and how Indian businessmen were becoming the wealthiest individuals in the world — and all this in a few months. Heady stuff for a country which is still one of the poorest country in the world and 50th from the bottom in HDI ranking. Greed had been raised to a new high pedestal. The news has been that foreign funds were investing heavily in Indian markets. They are supposed to be attracted by the rising value of the rupee vis-a-vis the dollar and the high returns being offered by Indian companies. There are several components of this flow from foreign shores. Rising oil prices have resulted in growing surpluses with the oil exporting countries and they have been looking for avenues to invest. Since the dollar has been declining, they are wary of parking all their funds in the US and in dollar securities and so they have been looking for alternatives. The Indian markets which have been rising because its corporate sector has seen a massive surge of profits seem to provide a safe haven for high returns. What could be better than this? The second component of this flow is the NRI funds which is also looking for diversification of portfolios for much the same reason. Till recently, they brought only little of their savings back to the country, but now they are doing so in bigger amounts. According to the just released World Bank report, India is now the largest recipient of non-resident transfers in the world. The third component is the flows from high export earners like China who are also looking for safer havens and diversification to park their surpluses and reserves. China and Japan have over a trillion dollars of reserves which till recently were mostly in dollar-related securities. The fourth component is the movement of funds by terrorist organisations, money launderers, smugglers, etc. Apart from continuing their political/business agendas in the country, they are also seeking diversification of their financial operations. In the Indian context, the participatory note (PN) route, a financial instrument operated by the FIIs, has provided a new way of investing in the Indian markets in which the investors identity remains a secret. The secrecy is required since there is illegality and possibly criminality associated with these funds. About 50 per cent of the FII funds now belong to this category. India’s National Security Adviser has expressed worry over the operations of illegal money and terrorists through the bourses, to channel funds not only for their own use but also, perhaps, to destabilise the economy at some point. The RBI has expressed worry about this phenomenon, and now SEBI has followed suit. This route has also been useful for Indian politicians, businessmen and other corrupt people to bring back their black savings stocked abroad over the last many decades. They can whiten their money through this device. That is why the Indian establishment has not touched this route in spite of the ill effects it is having on the economy in recent times. The Indian businesses have had another important reason to bring back their money, namely, to invest in their own businesses, given the need to protect themselves from hostile takeovers. Further, as for others, of late, dollar havens are not all that safe or lucrative as compared to the home market. Finally, the real estate boom in the last three years has peaked and some funds are being withdrawn from there to be parked in the rising share markets. The Indian stock markets have been known for severe manipulations by the owners of companies, financiers and brokers who indulge in insider trading and fixing of prices. It is suspected that the recent boom has come in handy for such unscrupulous elements to take advantage and raise the prices further. Often, owners of the companies not doing well use this device to manipulate the price of their stocks and make huge gains at the expense of the gullible small investors. The media is cynically used to plant stories. All this has been noticed in the past three stock market booms in the last 16 years. Something similar seems to be happening again. Why do prices not shoot up like this in mature economies? The reason is that the Indian markets are rather narrow. The organised sector of the Indian economy is less than 50 per cent and employs only about 6 per cent of the work force. If the government is taken out of this, the rest would be the corporate sector which is broadly represented in the stock markets. Thus, the private corporate sector is not more than 30 per cent of the national output and employs only 2 per cent of the work force. Further, the ownership of this sector rests with less than 0.1 per cent of the population. The public owns only about 10 per cent of the shares of the corporate sector. The vast bulk is held by promoters, FIIs, financial institutions and the like. In fact, a large part of the FII holding also belongs to the friends of the promoters so that no threat of takeover emerges. In companies like Wipro or Infosys, the number of stock holders is less than a few thousands and the owners and FIIs own around 90 per cent of the equity stock. The result is the small floating stock of shares (especially of the good companies) in the Indian markets and little relationship with the larger economy so that a small infusion of funds can cause large price changes. This along with the above mentioned manipulations make the Indian markets volatile. This is compounded by the fact that the return on stocks is largely made up of capital gains and not dividend. Thus, if the market stops rising, the expected return becomes very small and then it is not worth investing. In other words, when prices change rapidly, there is no stable resting point for the stock markets. A rapid rise invariably leads to an equally rapid opposite movement. Fluctuating markets do not move with the fundamentals. In fact, most of the time, they are not in sync. The increase in wealth associated with the stock market boom is notional. It is based on a small amount of trade and does not correspond to any real increase in wealth. This causes imbalances in the economy because it is concentrated in the hands of less than 0.1 per cent of the economy and spells danger for the country with vast sections getting marginalised and instability in society rising. It results in the devaluation of work and weakening of democracy. The participatory notes story and the market gyrations suggest that the Indian markets are substantially driven by government policies as manipulated by vested interests. Today, they exercise their influence as members of Parliament, ministers and members of advisory boards of legislative and governmental bodies. These interests have become accustomed to having things their way, so even a slight disturbance comes as a rude shock, like the news that PN story may be coming to an end because it is not good for the vast majority of Indians. Under the circumstances, can good policy or national policy making other than what suits these vested interests make sense? The writer has to his credit a book, “The Black Economy in India”, brought out by Penguin India. The first time I came across the slogan “Chak De” was when I was driving beyond the Rohtang pass into the Lahaul-Spiti valley a few years ago. It was profused written all along the perilous passage as the war cry of a border road organisation. When I asked one of the officers he explained that since their organisation was largely involved in clearing snow from hill tracks this exuberant exhortation served remarkably well in enthusing the force to show phenomenal results. It was working its magic and the snow used to get lifted in record time. The thunder was eventually stolen by Shahrukh Khan in the recent celluloid magnum opus in which the national women’s team was shown to have been galvanised into a well-oiled machine by a sports psychologist coach who followed his carrot-and-stick policy to get the best out of his motley team. The film had an electrifying effect on sports psyche. The men’s hockey team did well in the recent Asian Cup matches against the litany of the theme song “Chakde India” from the stands. The credo of “Chak De” seemed to do its trick again in the renaissance of Indian performance in the recent twenty-twenty Cricket championship in South Africa. The musical reverberation of the “Chak De India” served as patriotic tonic leading up to the victory in the final against arch rivals Pakistan. Victory for India or Pakistan has always had a great cathartic effect on the respective peoples. This time it worked happily for the Indians. That the Punjabi slogan “Chak De” came to symbolise Indian response in the arena of sports was a happy respite from its usual misuse in other contexts. Often used as a macho sexual innuendo in the rural jargon it has also been used in another favourite Punjabi pastime — drinking. Often used in finishing the whiskey peg in one go it is more or less synonymous with the bottoms up approach. A variation of “Chak De” has been doing its rounds as a joke. A foreigner was drinking with a Punjabi buddy in a pub. Every time the Punjabi tippler would exhort his firangi companion to finish the peg in one go he would say “Chak De”. They kept on following the commandment of “Chak De” till the firangi could take it no more and fell down. To the next suggestion of “Chak De” the firangi retorted. “No more Chak De”. This is how far the spirit of the magic word could go. So much for the Punjabi macho which has included fresh terminology to the lexicon of sports bravado. 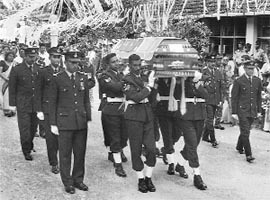 Sri Lankan soldiers carry the coffin of an officer who was among the servicemen killed in the LTTE’s air attacks on a military air base. Earlier, on March 27, 2007 , by successfully executing a spectacular nocturnal air raid on the Katunayake air base near Colombo, the LTTE had demonstrated that its rudimentary air wing had finally acquired teeth. Palaly had also been similarly hit. These successful air strikes against military targets mark a new escalation in the level of Sri Lanka’s ethnic conflict by an order of magnitude. The LTTE has been known to be building an air wing since about 1998. This effort had suffered a setback when Sornalingam, alias Colonel Shankar, the brain behind the air wing, was killed in a Sri Lankan Army raid. The first Tiger airstrip was built at Iranamadu almost a decade ago and has been subjected to frequent air attacks by the Sri Lanka Air Force. During the ceasefire period, the LTTE developed a second airstrip at Pudukuduiruppu, about 26 km northwest of Mullaitivu. The LTTE has been training suicide bombers to fly small aircraft into high value targets much before the al Qaeda terrorists flew large airliners into the World Trade Centre and the Pentagon on September 11, 2001. In a commando-style LTTE raid on Katunayake air base on July 24, 2001 , the Sri Lankan Air Force and some commercial airlines had lost over a dozen aircraft. The known fleet strength of the LTTE air wing is two light aircraft and two small helicopters, besides a few micro-lights. The light aircraft are of the HPT-32 trainer aircraft class and are suspected to be Czech-made Zlin-143s. These are propeller-driven, piston engine aircraft on which rookie pilots normally do their basic training. Most flying clubs possess such aircraft. These aircraft can be innovatively modified to carry two free-fall light bombs as the explosive ordnance by modifying the undercarriage and designing a rudimentary electronic bomb release circuit. In the raid on Colombo, the pilots flew almost 400 km over hostile terrain to execute a difficult mission against a high security air base. Though the damage was low, the impact was considerable. It is well know that some years ago the LTTE had managed to procure surface-to-air missiles (SAMs) from various sources, including the Pakistan-based terrorist group Harkat-ul-Mujahideen and had fired these against military aircraft. Of late, the LTTE has again been scouting the global grey market for anti-aircraft missiles. In February 2007, former Marine Corps General Erick Wotulo of Indonesia was reported to have been nabbed by the FBI in a sting operation in Guam. He was convicted for involvement in procuring arms, including anti-aircraft missiles, for the LTTE. As the success rate of security agencies is rather low due to the clandestine nature of arms sales and their transportation, it is possible that several consignments may have actually reached the LTTE without having been discovered. The LTTE air raids bring out several lessons for both Sri Lanka and India. The Sri Lankan government can ill-afford to ignore this new threat from the LTTE. It must invest in better air defence coverage of Colombo international airfield, other air bases and key installations by acquiring long- and short-range radars for early warning and SAMs to shoot down hostile aircraft approaching the airfield. Reprisal bombings of the LTTE air bases will be counter-productive. The Sri Lankans must plan a joint air and ground commando operation to destroy the LTTE aircraft wherever these are hidden near the airstrips. It will be an extremely difficult operation to conduct successfully, but one that can succeed if intelligence acquisition is accurate and a bold plan is made. As far as India is concerned, there is no immediate threat and, therefore, there is no need for knee-jerk reactions. Threats equal capability into intention and while the LTTE has demonstrated the capability to strike targets on ground from the air, however rudimentary it might be at present, it has not conducted major acts of terrorism in India since the assassination of Rajiv Gandhi. However, intentions can change and India must take the measures necessary to gradually beef up its air defence capability in Tamil Nadu. All important airfields and other vulnerable installations must be provided protection. There are bound to be many gaps in the radar coverage as southern India has never been threatened from the air by India’s major military adversaries. These gaps must be eliminated over a five-year period. Quite obviously, there were gaps in intelligence acquisition and assessment. LTTE pilots must have trained diligently for this complex operation and these activities should have been picked up and reported. The newly established National Technical Reconnaissance Organisation (NTRO) and the Aviation Wing of R&AW must enhance their surveillance of the areas east of the Ramnad coast. The LTTE must be warned that any violation of India’s airspace will not be acceptable and will result in instantaneous punitive retaliation. The LTTE still has the ability to strike telling blows against the much larger and better-equipped Sri Lankan armed forces. It may be down, but it is far from out. Finally, the acquisition of potent air-to-ground strike capability by a non-state actor poses a new challenge to the international community. As other non-state actors and terrorist outfits pick up the aerial gauntlet in the years ahead, it will be a challenge that will be difficult to meet. Myanmar is Asia’s fastest-growing petroleum exporter; China is the world’s fastest-growing importer. In May, Myanmar awarded China long-term access to its two largest offshore natural gas fields – turning down rival bids from India and South Korea. China returned the favor by blocking a U.N. resolution seeking an embargo against Myanmar. For Myanmar’s people, the government’s natural gas exports to China have a bitter irony. Myanmar is not a major gas producer; neighboring Thailand and Bangladesh, for example, produce more. But Myanmar is so poor – thanks to the military junta’s ineptitude – that it cannot consume the natural gas it produces; this leaves it with a large surplus to export. Thus Myanmar’s poverty is the junta’s salvation. As in other states beset by the so-called “resource curse,” Myanmar’s natural wealth helps keep a despotic government in power and fosters corruption and civil conflict. What makes the petro bullies unique is their ability to buy political protection from powerful allies. Sudan’s president, Omar Hassan Ahmed Bashir, has used oil sales to China to hold off, then dilute, diplomatic pressure to stop the slaughter in Darfur. The government of Equatorial Guinea has one of the worst human rights records in the world , but thanks to its oil riches, it was welcomed in Washington, D.C., last year by U.S. Secretary of State Condoleezza Rice as a “good friend” of the United States. Another good friend, the Saudi royal family, rules one of the world’s most undemocratic regimes. Some petro bullies violate treaties or pose threats to neighbors. Iran’s uranium enrichment program violates the Nuclear Nonproliferation Treaty, but its government is counting on its oil to buy its way out of trouble. Even when they do face sanctions – as did Libya’s Moammar Gadhafi , or Iraq’s Saddam Hussein after the Persian Gulf War – their oil exports allow them to evade economic pressures or cushion their effect. The world’s thirst for hydrocarbons has thus created a class of well-funded but unsavory governments that have little fear of economic sanctions. If the United States and its allies refuse to buy their oil, someone else will. Unilateral sanctions, like those announced by Bush, might help. But as long as Myanmar and other governments have petroleum to sell, they will have plenty of hard currency with which to buy new friends. The link between oil riches and bad international behavior is even deeper than it first appears. One way to measure a country’s so-called “global citizenship” is to count the number of major international treaties that it ratifies. Another way is to count its donations to U.N. peacekeeping operations. By both measures, oil-exporting countries are unusually bad global citizens. They tend to ratify fewer major treaties and make stingier donations to U.N. peacekeeping operations than nonoil-exporters with similar levels of wealth. Russia, Venezuela and Saudi Arabia, for example, use oil and natural gas exports as a substitute for international cooperation. None of the bullies will run out of petroleum soon. But their political influence tends to rise and fall with world energy prices. The higher the price of oil, the less susceptible they are to diplomatic pressures. When oil prices drop, so does their ability to buy powerful friends. If Congress adopts an energy bill that produces large cuts in U.S. oil and gas imports, world prices will drop and the lower the price of oil, the greater the chance that Myanmar, Sudan, Iran and others will ultimately have to face the consequences of their actions. The writer is the director of the Center for Southeast Asian Studies at the University of California, and an associate professor of political science. Some use it as a status symbol. It’s absurd – the kind of money that is going out of the exchequer’s pocket, just to massage the ego of the influential. Such decisions of the judiciary are welcome any time. The cops on duty at times have interesting stories to tell of the people they protect, who are criminals in their own right, and are using government machinery for protection from others in their own community. Thanks to the “Rahul magic” the Youth Congress is all set to attract new members. It is targeting a base of 2.5 crore primary members by 2008 with forms in 13 languages and primary members will have identity cards. The I-cards will have images of Sonia and Rahul Gandhi. Hence the IYC office has had hectic activity ever since Rahul Gandhi was appointed general secretary. Reshuffling and appointment of office bearers at the district and block levels are on hold. Those turning up at the IYC office with requests and recommendation letters for appointments are being told to show results in the recruitment drive before expecting favours. Office bearers have been sent to all nooks and corners of the country to attract new members. The Congress has been concerned with its dwindling mass base for some time now. Even before Rahul Gandhi took over as general secretary, he had asked the IYC to focus on UP, Bihar, Madhya Pradesh, Gujarat, Orissa, West Bengal and Karnataka. The Gates of 24 Akbar Road will no longer be shut when Rahul visits his office. The barricades that are normally set up when he or Congress president Sonia Gandhi visit the place are missing now. He walked in unannounced. Rahul is familiarising himself with the functioning of the organisation. This became clear after his visit. He inspected the rooms of the general secretaries, secretaries, chairmen of various departments and cells. He also went to the canteen and servant quarters. But he is still shying away from interacting with the media formally or informally, though he had a look at the media room, the reception and control rooms. While at the headquarters, the SPG was asked not to check the flow of visitors to the party office. And to encourage the youngsters Rahul Gandhi played cricket with the youth congress and NSUI guys. Of course, he did not bat or bowl. Sister Priyanka and hubby Robert were present to cheer him. Rahul’s team won, of course. Now he is off to China as the General Secretary of the Congress with his mother, the President of the Congress. As part of his grooming, a lot of exposure is being given to Rahul.